Blazers are a fashion trend that has been around for decades but in the last few years they have become extremely popular, most girls own at least one blazer nowadays and they are a great wardrobe staple because they go with absolutely anything. A blazer can really make an outfit, if its jeans that you are wearing it will really dress up your denims making your look ideal for evening wear. 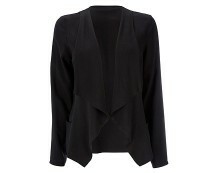 A blazer is also a very practical jacket for work its comfortable, stylish and relaxed. Now that the colder weather is on its way a blazer could be the ideal jacket to wear over evening dresses, it will add class and style to your look. 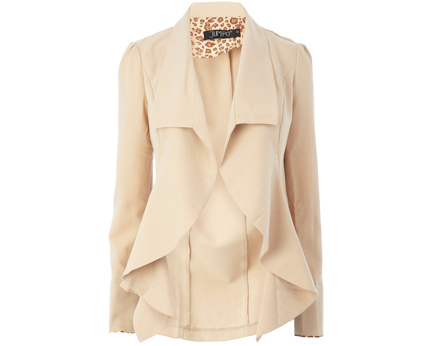 The cream Jumpo waterfall blazer is a fresh new take on blazers; the design features a draped waterfall front that offers a cool relaxed feel, the material is soft and comforting to wear and the roll up sleeves give this design some edge. 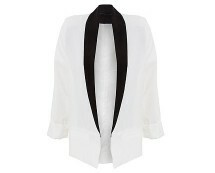 Styled however you like you can create edgy or sophisticated look with a blazer like this!